Draft and build a tableau of different characters to create the most prosperous settlement in Villagers, an upcoming card drafting game by Sinister Fish Games. 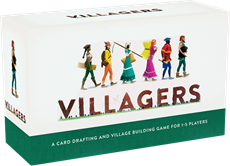 Villagers is a tableau building and card drafting game where each player is in charge of populating a new village. Cards are played in production chains, starting with basic resource producing cards who can each support two chains of related workers. Special villager cards allow for crafty strategic play, and certain villagers produce tools and equipment that others need, allowing you to profit from what your opponents build. At the end of the second market phase, scores are totalled and the winner decided. Try the game out on Tabletopia and support it on Kickstarter!